No ones needs a reason to eat Pizza, but let's make this the perfect occasion. - Dallas Pizza Parlors and Trucks. - Kids Bounce Land - Live Music & Shows - Beer & Wine Garden - Celebrity Chef - Pizza Eating Contest and more! No ones needs a reason to eat Pizza, but let’s make this the perfect occasion. - Dallas Pizza Parlors and Trucks. 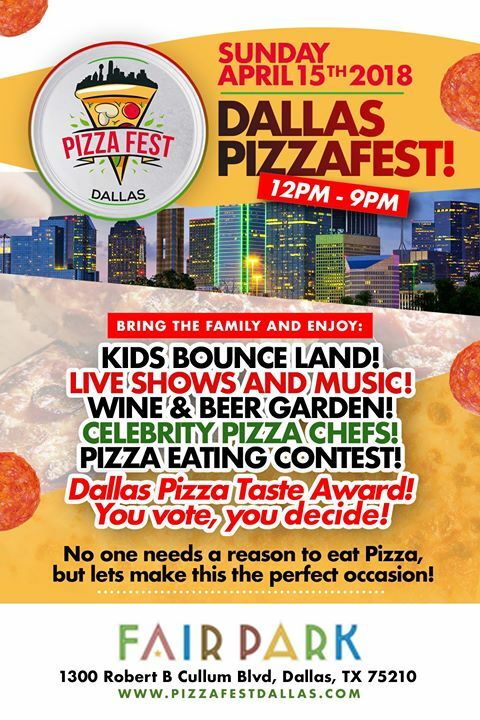 - Vote for Dallas Pizza Taste Award! Each Ticket comes with a Slice! This yummy event is open to All Ages. Everyone loves Pizza!